I now have an agar surface with Panellus stipticus, a bioluminescent mushroom and mycelium. I was thrilled to see the surface glow in the dark, but it takes a minute for one's eyes to properly adjust to see it at this point. Now I am ready to inoculate sterilized spawn bags of oak sawdust with wheat bran supplementation in hopes of eventually fruiting it out. Does anyone have any experience mixing this mycelium into a liquid innoculant via a blender like it commonly done with other types of mycelium? 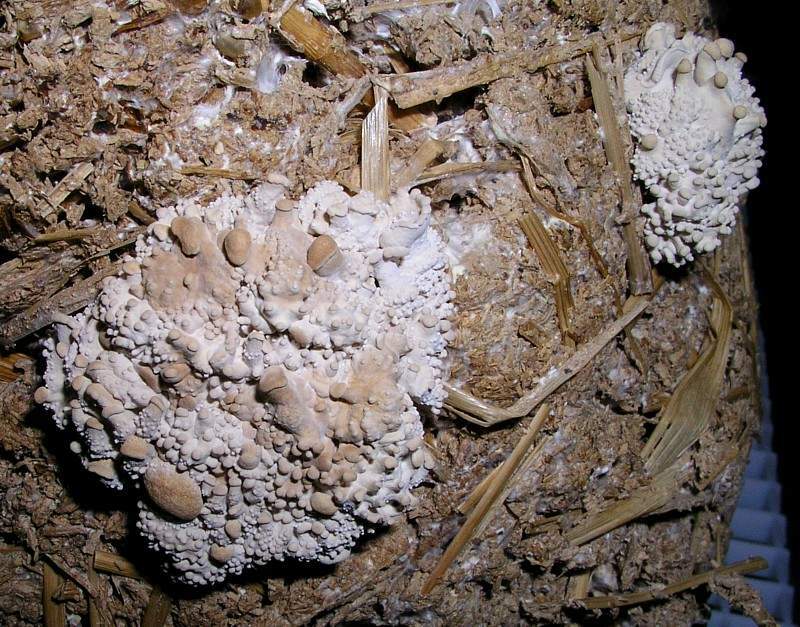 I read that not all mycelium survives such mixing methods well, and it's hard to find any information out about this one. Since no one seemed to know, I went ahead and tried liquid techniques for this mushroom. I am happy to say that liquid techniques do work for Panellus stipticus. The recovery time for my plates was a whole week before I noticed growth, but they are definitely doing okay. This mushroom grows painfully slow on my PDYA. Maybe a little sawdust would have helped things along, but I am purely guessing here. I am incubating around 77F, yet a full plate takes about 6-8 weeks to colonize. Interesting, a petri dish takes only three weeks here. I transfer wedges from the petri dish to rye berries. When colonized, those are transfered to wood chips/sawdust for fruiting. I love to wake up in the middle of the night and see the jars glowing. What is your approximate incubation temperature? What agar formulation are you using? What type of sawdust and chips are you using to fruit out? I am trying to fruit out solely on supplemented oak sawdust. Do you think it'll work even without he chips? I would use something besides just sawdust in your next jar. Perhaps get a sheet of birch plywood, and rip some strips off it. Hydrate and place along with the sawdust. Another alternative is the alder chips sold at the grocery store near the charcoal. I incubate at room temperature. Where I live, I don't think they sell alder chips for barbeque. I'll take a look, but I tend to notice stuff like that. I do have some aspen chips from rodent liter, but I know alder is better. I did not bother using the aspen chips this time but maybe next if I cannot find the alder. Oh, and I am not using jars. The oak sawdust is in large spawn bags. It is mixed with some bran, a tiny bit of gypsum, and generous amount of vermiculite for water retention. Would either of you part with a culture? I don't grow actives anymore, I think biolumes would be a fun way to get back into growing. By the way... Does anybody know how to get sharpie markers off of a computer screen? I'll have some photos to share soon (been out of the loop for awhile on other projects), but in the meantime, I've had recent success fruiting P. stipticus using supplemented (bran) oak sawdust with alder chips (~10%/volume). The fruits seemed to occur only off the alder chips, rather than sawdust, so I'm beginning to think solid wood chunks are essential for good fruiting. Anyone have a starter culture? I have plenty to trade... If you can charge less then the vendors, I have cash. I would realy like a chance to work with this one. Well, time to revive this thread! Okay, I just wanted to let everyone know that liquid culture techniques work fine with Panellus stipticus. However, using a malt/dextrose sugar mix with continuous stirring, I found the culture grew fairly slow. It took about 2 weeks to really achieve a decent mycelium density. That liquid culture was injected liberally (140cc per large spawn bag) into the wood-lovers wood chip + saw dust + oat bran formula in Paul Stamets Growing Gourmet and Medicinal Mushrooms (GGMM). I also added some straw and vermiculite in the mix to make it lighter. I used hickory for my hard wood and pure oak saw dust. Growth in the spawn bags was really slow. It took about a month for them to colonize through despite using the liquid culture techniques. I then opened the bag and put the whole thing in the fruiter. It took about another month before I saw anything happen, but eventually I saw pins! I was very excited. The pins glow about twice as bright as the block too. I have had this same thing happen to me. I didn't use the straw, but with a standard wood chip, sawdust, bran formula, the pins also didn't develop. Try without the bran and just using a 1:1 saw dust and chip mix. The pins should develop the rest of the way. 2,831 topic views. 2 members, 9 guests and 1 web crawlers are browsing this forum.